Passive Solar Energy . . . Free Energy by Design! Passive Solar Heating . . . Passive solar energy is a renewable and clean energy source that can be directly converted to heat or thermal energy. This form is often referred to as passive solar. Passive solar is not what most people think of as solar power, but rather a type of architectural design . . . a powerful design element which, if utilized well, combines beauty and purpose effectively and inexpensively to use the sun's energy for heating and cooling a building. Passive solar energy in this form is used to heat water and pools — and of course a properly designed house will optimize the light and heat qualities of the sunlight that streams into the south-facing windows. Some of the common components of a passive solar energy system are south-facing windows. In the winter they collect the sun's rays and in the summer, properly designed eaves and strategically located deciduous trees on the south side of the house can help to provide cooling. The angle of the sun in relation to the eves, and the leaves on the deciduous trees prevent or minimuze heat gain through these same windows. 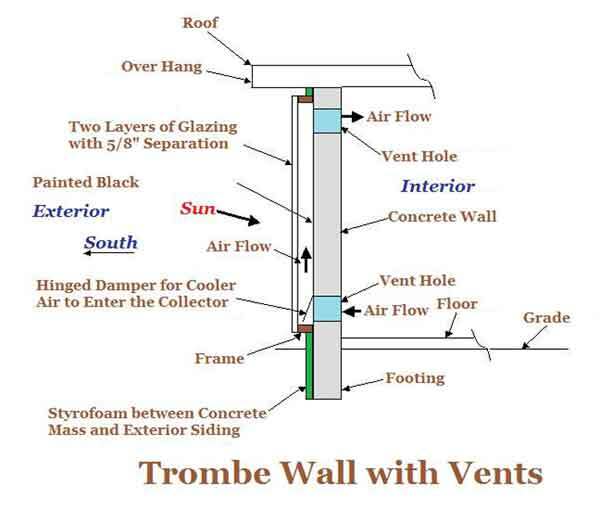 Another passive solar energy design uses what is commonly known as a Trombe wall. This is a sun-facing wall making use of either single pane glass, or insulated glass; and an air space that absorbs solar energy through the daylight hours, and selectively releases this stored energy into the interior of the home at night. There are various ways this is accomplished. Some make use of small venting motors to control the heat, and some that are totally unvented, design the wall mass as a large heat sink that radiates the conducted heat from the interior side of the wall during the colder hours of the night. Of course an all passive system (no mechanical vents) must also have well designed summer heat protection as described above. Typically passive solar designs apply glazing or windows, which capture the energy, and transfer it to a thermal mass, such as concrete or masonry walls or floors, or water that is used to store heat energy for extended time. Most systems also employ a thermal chimney that encourages the effect of heat rising to create air movement for cooling purposes. 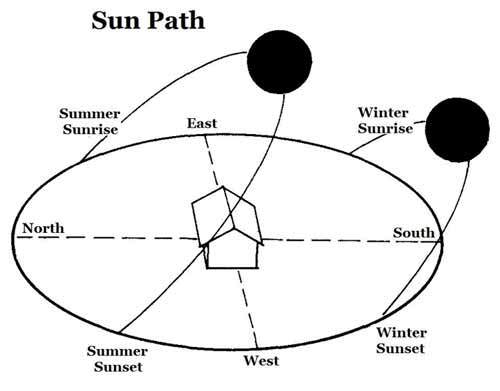 As is obvious, the orientation of a home in relation to the sun, wind patterns, vegetation location, and terrain, as well as properly sized and placed windows, thermal mass, wall colors, and venting will all have a substantial effect on the passive solar energy performance of a building. These are all design elements. The best passive systems are simple, have few moving parts, and require minimal or no mechanical systems to maintain. Passive solar is a very socially responsible use of energy because it's principles reduce energy use without additional costs. Because of very little additional cost, it is viable in any climate, though performance varies with the available sunlight.